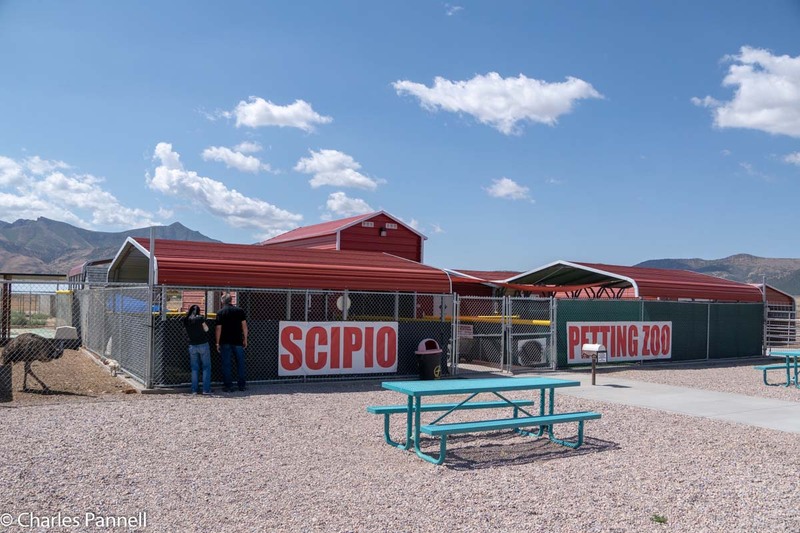 This roadside attraction serves double duty, as it’s located at a Flying J Truck Stop, where you can also gas up, use the facilities and grab a bite to eat. The zoo is just across the parking lot from the gas station, and the closest accessible parking spot is next door, in front of the Dairy Queen. There’s level access through the paved parking lot, but there’s about a 15-foot stretch of gravel in front of the zoo entrance. If you can make it over the gravel, there’s a level sidewalk up to the zoo, and barrier-free access inside. But truly, most folks will need some assistance over the large chunks of gravel. The zoo contains a nice collection of animals, including everything from rabbits and goats to ostriches, emus and even alpacas. The owners are friendly and they usually offer kids pellets to feed the animals; and the animals themselves seem to be pretty spoiled. The zoo is usually open on weekends, but to be honest the operating hours do vary. On the plus side, even if the gates are locked you can still get catch a gander at some of the animals through the fence. And then there are the errant peacocks, which pretty much have free run of the place. It’s a fun stop for slow walkers and wheelchair-users who have a little assistance. Located south of Salt Lake City at exit 188 off of Interstate 15, it’s pretty easy to find too. You literally can’t miss it! Interstate 10 — which snakes over 800 miles through Texas — can present quite the monotonous drive. That said, if you find your eyelids drooping near San Antonio, then take exit 585 and enjoy this interesting — and massive — art installation. Just go north on FM 1516 for about a half-mile, to Hays Park Road, and take a right. You can’t miss it — just look for the giant American flag. 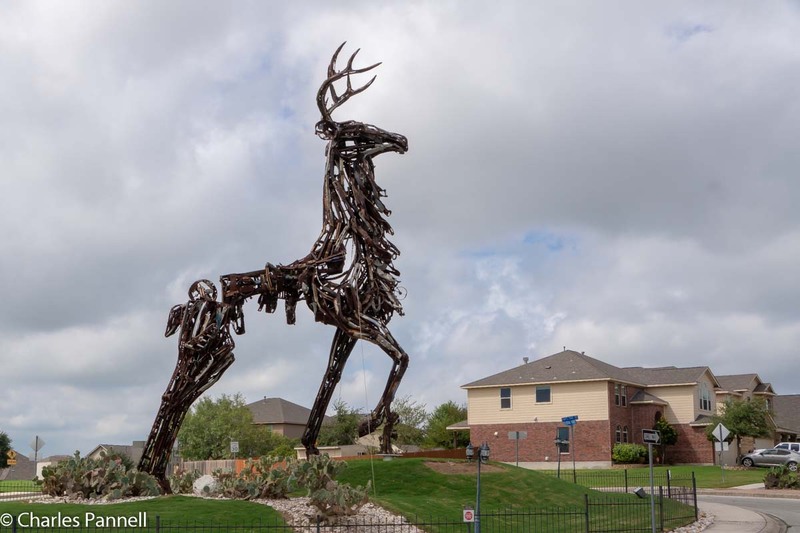 The larger-than-life stag sculpture is perched on a mound of dirt in the first round-about through the upscale subdivision. There’s parking in a level paved lot near the playground, which is the perfect vantage point to view the piece. Crafted by Mexico City artist, Florentino Narcis, this community centerpiece is comprised of junk, including engine parts, rusted fenders, license plates and even a bicycle seat or two. Check it out and see how many scrap parts you can spot. And if you’d like to get a closer look at the sculpture, there’s curb-cut-access to a short sidewalk from the parking area. There aren’t any public facilities at this stop, but this interesting sculpture is definitely worth a short look on the way through the Lone Star state. 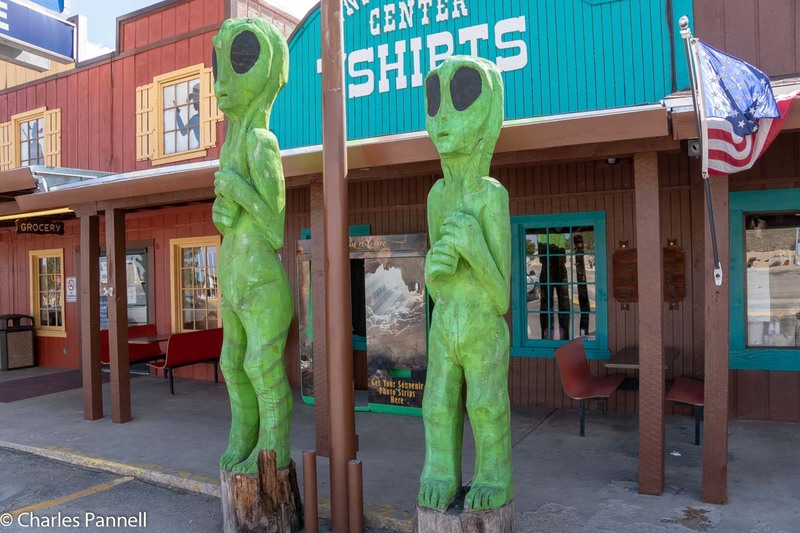 Although they seem a bit out of place, these two 10-foot tall aliens sit in front of Whites City Trading Post, just off Highway 7, on the way to Carlsbad Caverns. 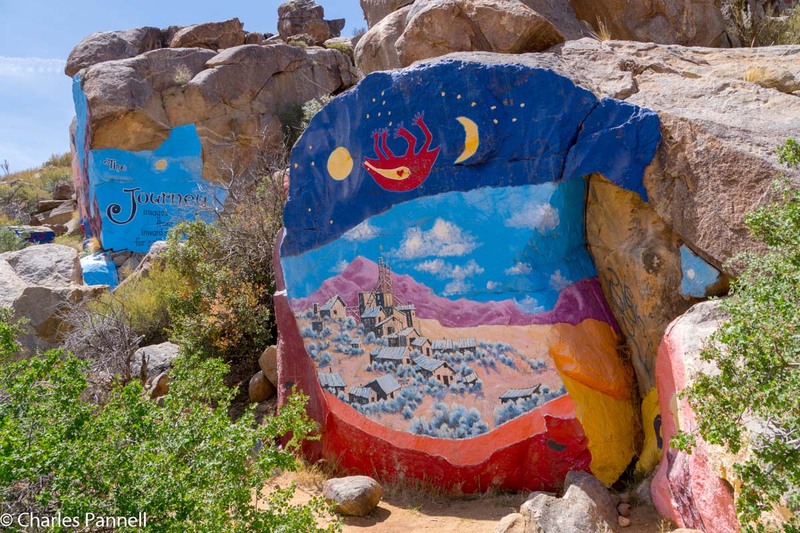 There’s no interpretive plaque at the site; however locals say that the tall green pair are remnants of the old Million Dollar Museum which formerly occupied the space, and had an “alien baby” on display. Today they offer a good photo op on the way to New Mexico’s only national park. Accessible parking is located in front of the trading post, with level access over to the aliens, which are said to have been carved from tree trunks. It’s a fun stop, especially if you have kids in tow. 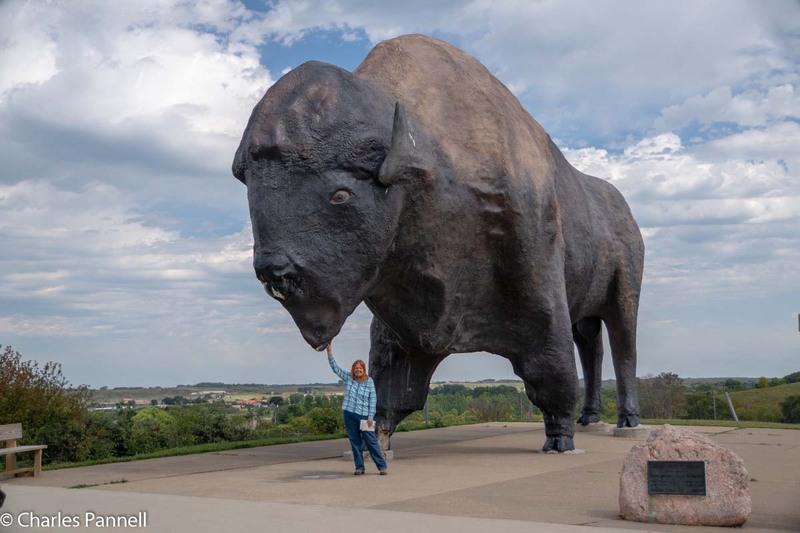 Erected in 1959 to draw tourists off the newly constructed interstate, the big buffalo lacked a name for 50 years, after which it was christened Dakota Thunder. It’s fabricated from steel beams, wire, and three-inch thick gunite; and it stands and impressive 26-feet tall and tips the scales at a portly 60 tons. The original sculpture — which was repainted in 2016 — cost the town $8500, which was nearly double the original estimate. It’s a fun photo stop, and if you’d like to also check out the stores in Frontier Town, there’s ramp access up to the boardwalk sidewalks and level access to most businesses. And if your lucky you may be able to spot the National Buffalo Museum’s bison herd from a vantage point near the statue. Best of all there’s no admission charge to the museum. And if you’d like to chow down at the restaurant, there’s also ramp access up to the front door from the accessible parking space. 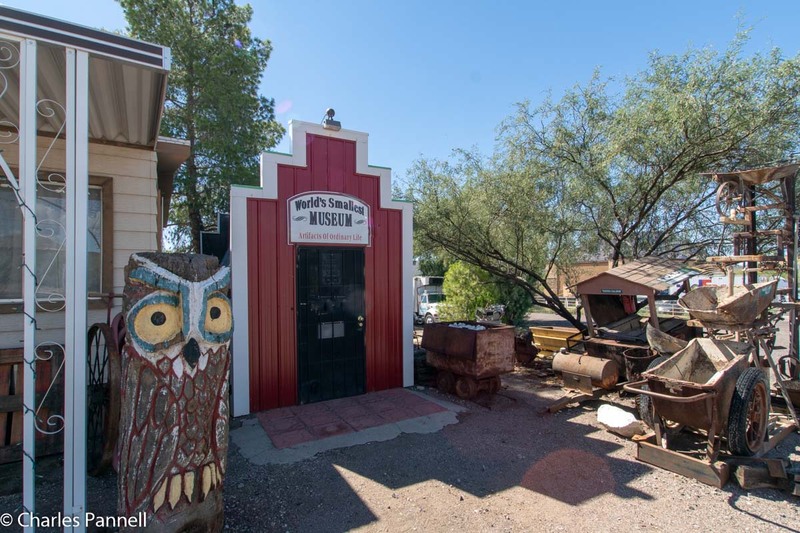 This tiny museum makes a good stop on the way to the nearby Boyce Thompson Arboretum.